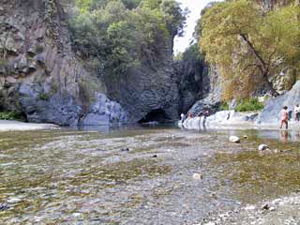 You will first reach the famous Gorges of “Alcantara”, with it's spectacular volcanic “canyons”. Then proceed on to Randazzo passing by the Mojo Crater, an archaic and secondary vent. In Randazzo you can stroll in the typical old medieval streets. Continuing to Bronte, the capital of Sicilian pistachios, Nicolosi, the so-called gateway to Etna, from where you will reach the “Sapienza” Refuge. Here you have the possibility to participate to an extra trip up to the summit of the volcano. Board first the cable-car up to 2600 mts high, then the all-terrain vehicles that will take you to the top (about 2900 mts). The Reserve, nowadays replaced by the newset up Alcantara Regional Park (www.parcoalcantara.it - www.parcoalcantara.eu), includes a part of the territori of the Alcantara River and its wonderful morphologies, shaped by its waters over the centuries. This is particularly verifiable in the spot where the river crashes into an imposing lava flow, carving unique and suggesting overhanging gorges. Together with an impressive group of lakes, springs, and falls, it is also possible to observe the marvellous columnar-structured lava flows with a prismatic base, decorating the splitted rock-faces of the basaltic rock. The study of these lava flows, carried out by geologists in their inner section thanks to the fluvial erosions, revealed several and important secrets about the history of Mount Etna and the sequence and dislocation of its eruptions over the years. In the 13th century the town had its own army, which fought in favor of the king against the rebels. In 1210 King Frederick II of Hohenstaufen and his young wife Constance of Aragon sheltered at Randazzo to escape the terrible plague which raged in Palermo. Randazzo became one of the most densely populated towns in the island, after Palermo and Messina. The town was also divided into three main districts: the Greeks lived in St. Nicola's quarter, the Latins in St. Mary's and the Lombards in St. Martin's. During the Black Death of 1575-1580 the population of Randazzo declined. The economy slumped, and Randazzo almost turned into a ghost town. During World War II, Randazzo was bombed by the Allies, destroying or damaging 76% of its buildings. Nicolosi is a city of nearly 5,000 located 700m a.s.l. 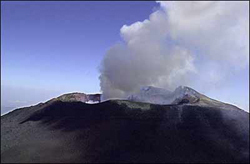 on the slopes of the volcano, hence regarded as the Gateway to Etna. On several occasions eruptions have highly damaged the city, 1669’s notably devastating. Both on this occasion and on following earthquake in 1693, the people proudly strove to restore the town back to its ancient splendor, rejecting the possibility to move elsewhere. The history begins in the 12th century, when a Benedictine Monastery dedicated to San Nicolò l’Arena was erected on a former Chapel. This was to be moved to Catania some century later. 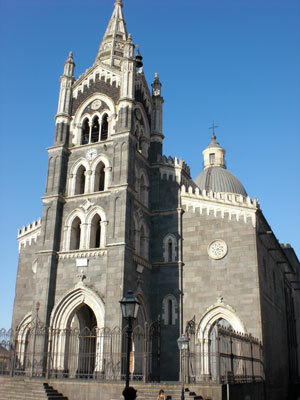 Around the monastery soon grew a village that took the name of the religious building, long ruled by the Moncadas.